STOP BY TODAY AND ENJOY OUR INDOOR BOW RANGE! Welcome to our website. 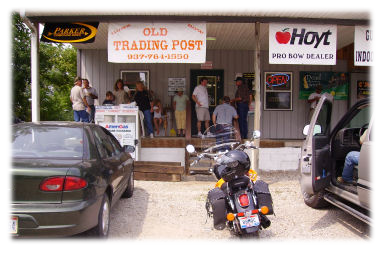 The Old Trading Post is a one stop shop for all your hunting needs. We hold by our commitment to customer satisfaction as the most important part of any transaction or sale. Because of this, we work closely with our distributors to develop relations affording us to capability to pass the savings directly to our customers. We take pride in knowing that in each sale, we have done whatever we can to insure customer satisfaction. We believe that once you experience the quality sales and service that we can provide you will not want to shop elsewhere. Cherry Bomb and deer attractants are in stock. Get your Scent Crusher products here!! © 2012 by Old Trading Post, Hillsboro, Ohio. All Rights Reserved.